Let’s take advantage of Kibana’s elegant geospatial (GEO) search function, and search for “think piece” keywords (“lonely,” “tired,” “happy,” “hungry” etc.) based on location. Freegeoip.net offers a free REST API to convert Internet Protocol (IP) addresses to GEO coordinates. 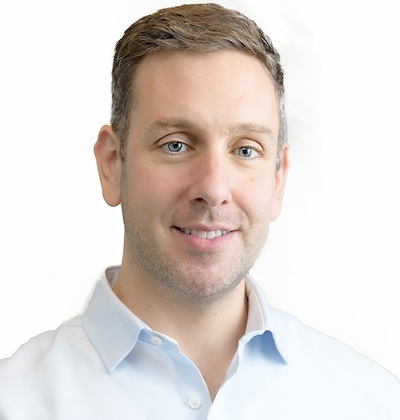 A call to a remote web service will inject seconds of latency to the timeline. The REST call must exit the local data center to an unknown location which could be anywhere on the planet. In addition to propagation due to latency, the REST call can expect firewalls, packet inspection, queuing and transmission delays. Once the call arrives at the remote server, the remote server may block the call, put the call on a queue or drop it all together. Due to the unpredictable channel, we cannot put GEO tagging on the “critical path” from quiz results to database entry. To overcome this unreliable, slow, yet necessary service we’ll use asynchronous calls. 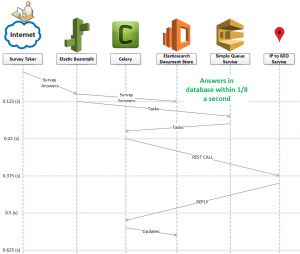 The controller takes the data from the test taker, validates it and sends it to the Elasticsearch document store. 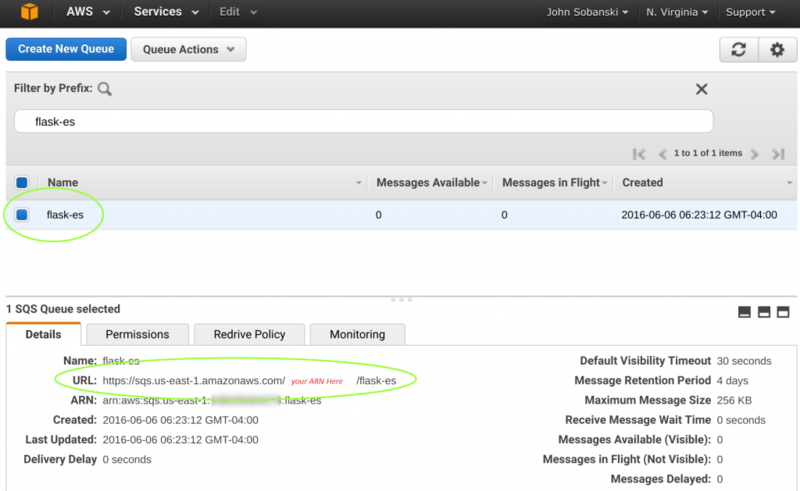 The controller also takes the data and sends it to a message queue (provided for by AWS Simple Queue Service [SQS]). Celery worker nodes watch the queue and pull off tasks as they arrive. Each worker node then makes independent calls to the service. Latency does not affect critical operations. The worker nodes update the Elasticsearch documents with information as they get it. A simple graphic illustrates this. Imagine that the web services remain in line. The controller cannot commit the document data until both services return. The server blocks for about 1/2 a second until it can update the document store (I use representative data for latency due to processing and propagation delay). Now consider a parallel approach that uses worker nodes and a message queue. We now get the same functionality, with the server freed up in 1/8 of a second. The free ‘IP to geolocation’ coordinate service does not require a login. We can use an HTTP GET to access it like any web page. 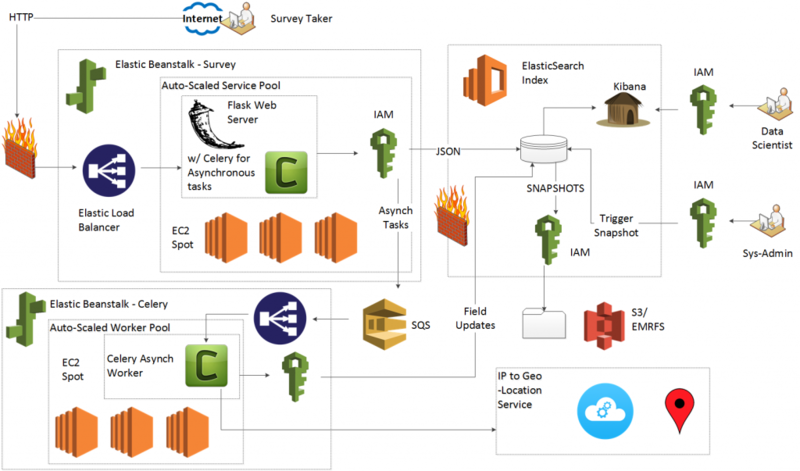 In order to use Celery, we need to both configure application.py (the controller) as well as deploy worker nodes as separate services. 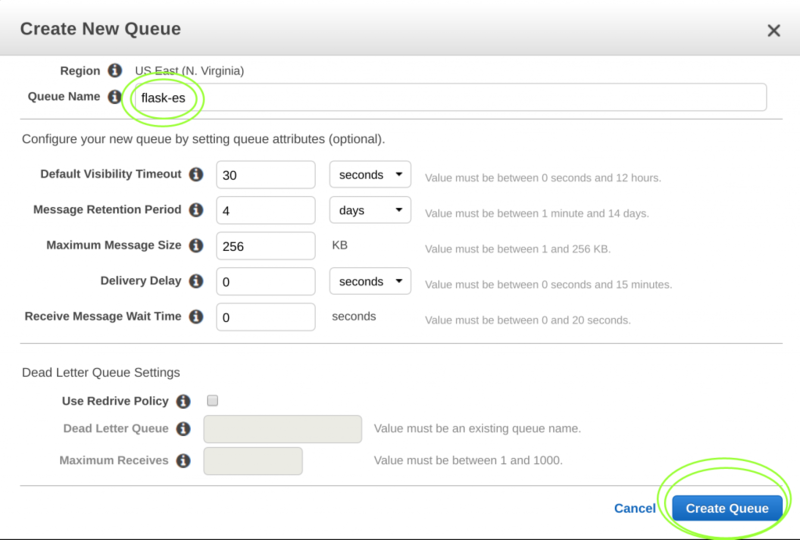 Amazon made the deployment of a Simple Queue Service (SQS) easy. 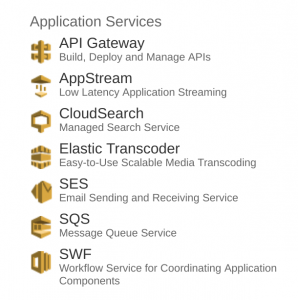 First, from the Amazon Console, find the “Application Services” section and then click SQS. HOWTO-1 we created and assigned an IAM role to our Jumpbox. 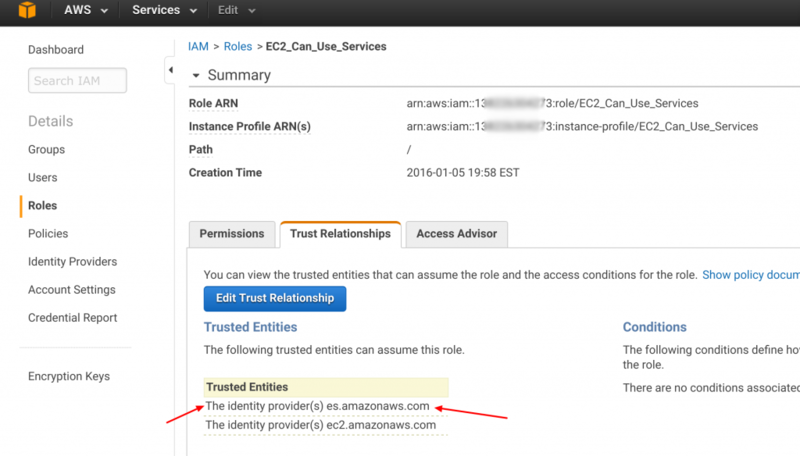 If you remember, we named that role EC2_Can_Use_Services. That hard work pays off again and again. 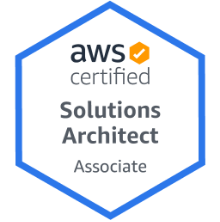 Right now we will simply add an SQS policy to our existing role. 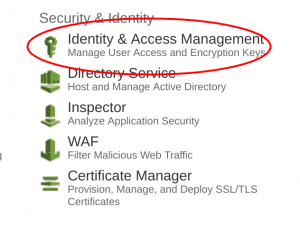 On the AWS console, click on the IAM icon. 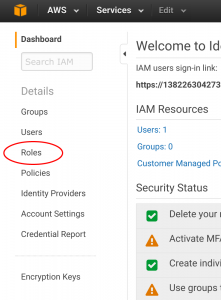 Then select "Roles" from the choices on the right. 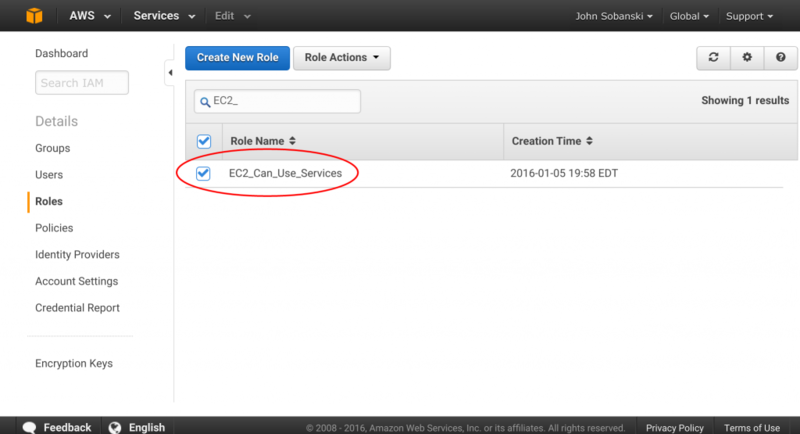 Now filter the roles and locate "EC2_Can_Use_Services." 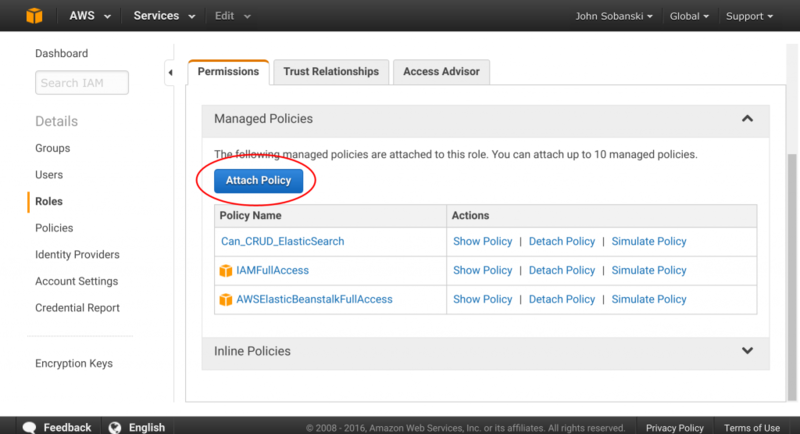 Click the "Attach Policy" Button. 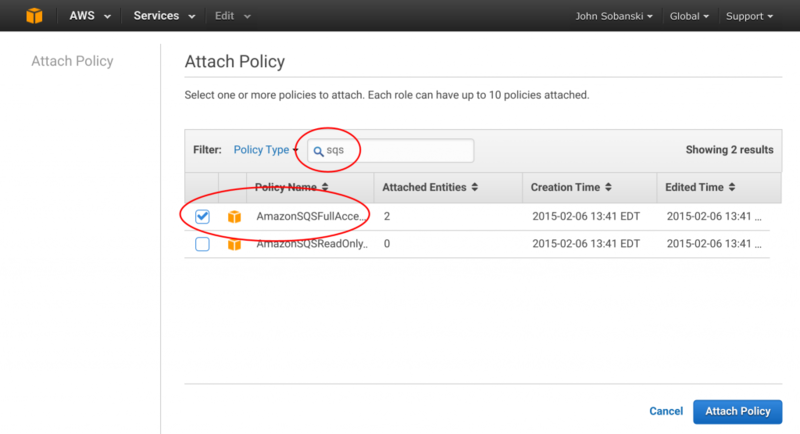 Filter for "SQS," select "Full Access" and attach. All done! Similar to Bootstrap, where we Bootstrapped our Flask application to use Bootstrap, we need to “Celery” our Flask application. We first activate our environment and then install the Celery Python library. On the worker side, we create “celery tasks” which poll the message queue until they receive a task. 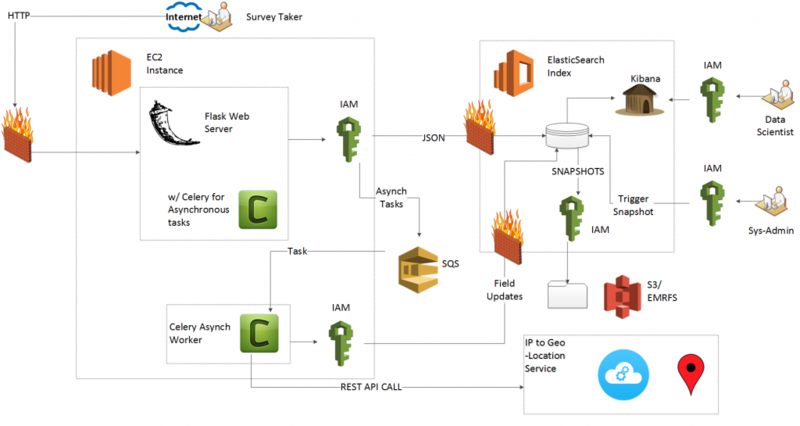 Upon receipt of a task, the workers will execute a call to the GEO lookup service. The controller passes the IP address and user ID to the worker node via the SQS queue. The worker node then appends the IP address to the freegeoip.net REST API GET method and strips the latitude and longitude from the response. The worker node then serializes the data into a JSON format suitable for the Elasticsearch REST API, and updates the document for the given IP. On the controller side, we add the task decorators and then update the ‘submit’ logic on the test taking route to include the asynchronous tasks. See the bottom of this post for the full code. Go to your application. We did not yet deploy to ElasticBeanstalk so you will need to go to the Public IP of your jump box, port 5000. Fill in the survey and click ‘submit.’ If everything works, you should see “Thank You” on your web browser. The messages tell us that our worker node reached out to freegeoip.net, executed an API call via HTTP and then exited successfully. Up until now, no documents included the “Geo” field. 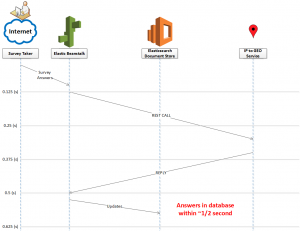 We will ask Elasticsearch to pull all documents from the index that include a Geo field. If ES returns a document, then we prove that the Celery worker updated a document with API results (coordinates). Since we use IAM roles, we cannot use CURL to query the database and instead use the following simple Python script. Execute the Python script to see the results. Notice in the JSON, we now have a GEO field, that maps the IP address to coordinates. In the next HOWTO, we will modify the “Geo” field type in the Elasticsearch document mapping and use the Kibana GUI to find quiz takers’ locations via a Google Maps like interface.